We’d love your help. Let us know what’s wrong with this preview of The Art of Prayer by Kallistos Ware. To ask other readers questions about The Art of Prayer, please sign up. My Spiritual Father gave me this book when I initially began to be drawn to the Orthodox Church. If you're interested in hesychasm, or seeking further, more intimate relationship with our Creator, I HIGHLY recommend this book. St. Theophan the Recluse will become like a mentor to you after flipping through this book. Best read in small increments. Very good and helpful read. Repetitive at times, which at first bothered me but I grew fond of the repetition about halfway through the book when I actually started to try to practice the things written here. This isn't necessarily the best intro to prayer. The part of the book dedicated to the Jesus prayer has a lot of good things for introduction, but as a whole, the writers speak of very high level concepts, sometimes written specifically to monks, and could be confusing or even disturbing to Very good and helpful read. Repetitive at times, which at first bothered me but I grew fond of the repetition about halfway through the book when I actually started to try to practice the things written here. I won't write too much on this, as I feel fairly unqualified, for various reasons, to write on religious books. (Though I will say that I find the great Vladimir Lossky to be absolutely impenetrable.) Still, I will note that I got this book long, long before I converted to Orthodox Christianity -- about seven years before, in fact -- and I found it a treasure then, and a treasure now. You don't need to be Orthodox to read, appreciate, and benefit from The Art of Prayer. The passages in this colle I won't write too much on this, as I feel fairly unqualified, for various reasons, to write on religious books. (Though I will say that I find the great Vladimir Lossky to be absolutely impenetrable.) Still, I will note that I got this book long, long before I converted to Orthodox Christianity -- about seven years before, in fact -- and I found it a treasure then, and a treasure now. You don't need to be Orthodox to read, appreciate, and benefit from The Art of Prayer. that book really took much time 2 b finished. I can't evaluate it properly. It was good I can't deny that,but how much good don't know. The topics r fantastic. I don't know what type of ppl I can recommend that book to, all I know it's not for beginners, u need to have background about the art of prayer before starting it 2 b able 2 understand the standards the book has. It has one big goal focused on , that was so good & useful to me. An advice, if get bored at the start, fight & keep goi that book really took much time 2 b finished. I can't evaluate it properly. It was good I can't deny that,but how much good don't know. The topics r fantastic. I don't know what type of ppl I can recommend that book to, all I know it's not for beginners, u need to have background about the art of prayer before starting it 2 b able 2 understand the standards the book has. As a guide to the Orthodox art of prayer this book is ideal. There is much repetition, but I find sometimes we need that repetition. A slight twist in how a sentence is phrased, or a slightly different context, can mean the difference between understanding and not. Highly recommended for anyone interested in true prayer rather than a superficial litany of material wants and desires. 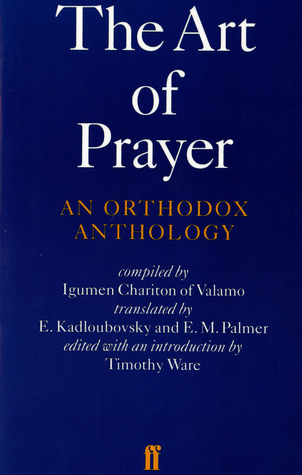 This is an Orthodox Christian anthology, largely taken from the Philokalia, on prayer. It includes sections from St. Theophan the Recluse, St. Ignaty Brianchininnov, and others. Highly recommended, although more for Orthodox than non-Orthodox. I'll always be rereading this book, till I memorize it. Loved every page, the kind of book you should carry with you everywhere or have by your bedside table and re-read over and over again. A true feast for the mind and heart. May God bless St. Theophan The Recluse and all the monks all over the world. “Lord Jesus Christ, Son of God, have Mercy upon me, a sinner”. I read this book based off of the recommendation to primarily focus on it's perspective on prayer but from how the ancient patriarchs heard the voice of God for their lives. This book had a few good insights into this process that I was looking for but the majority of the content of this book focus more on the traditional perspective of prayer in terms of what to say in prayer and quoting scripted prayers from different resources. His Excellency, the Most Reverend Metropolitan Kallistos (Ware) of Diokleia (b. 1934, also known by his lay name, Timothy Ware) is a titular metropolitan of the Ecumenical Patriarchate in Great Britain. From 1966-2001, he was Spalding Lecturer of Eastern Orthodox Studies at Oxford University, and has authored numerous books and articles pertaining to the Orthodox Christian faith.